The Joint Local Plan is in its final stage and is out now for public consultation on its modifcations. But only until MONDAY 3rdDECEMBER. I wish to comment and object to the following Major Modifications of the South and West Devon Joint Local Plan. Please acknowledge receipt of this card. 1. I object to the Revised Housing Topic Paper Addendum, October 2018 (pageVII) that allocates a surplus of 2077 houses. Accepting 900 houses from West Devon’s allocation to the South Hams will exacerbate commuting, countryside loss and urbanisation. 2.Policy MM30 (TTV NEW).Allocating at least 120 houses on Dartington Hall Estate plus over 300 on DHT owned land in Dartington parish, has not been founded on local housing needs, but the ‘need for housing and commercial development to generate long term funding streams…’ This is not a material consideration for planning. 3. MM39 Air Quality in AQMA’s. This policy is weak and should include the ‘in combination’ effects of developments that generate increased traffic. 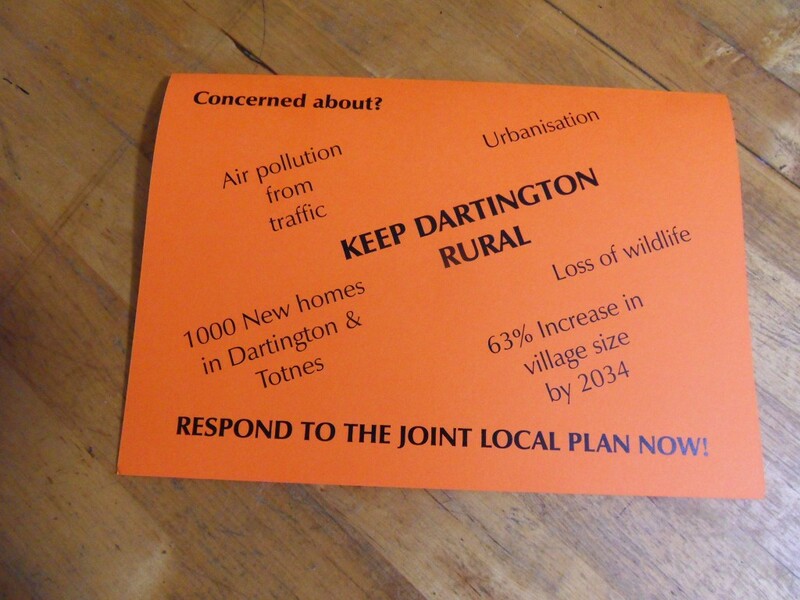 Allocating around 1000 new houses in Dartington and Totnes, where World Health Organisation limits are breached daily will adversely affect people’s health. Your personal comment. (You must add your own, thank you)…………………………………………………..